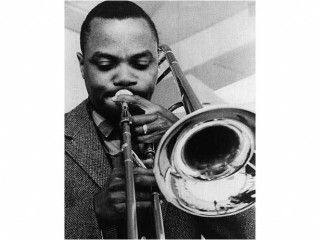 J. J. Johnson was a United States jazz trombonist, composer and arranger. He was sometimes credited as Jay Jay Johnson. Johnson was one of the first trombonists to embrace bebop music. He has long been regarded as one of the leading trombonists of the post-swing era, exerting a pervasive influence on other jazz musicians. Considered by many as the finest jazz trombonist of all time, J.J. Johnson was a visionary force on his instrument. His developments for the bebop and improvised style on trombone placed him on a par with Charlie Parker on alto saxophone and Jimi Hendrix on the electric guitar. "J.J. elevated the trombone to a higher status," said trombonist Curtis Fuller, according to Down Beat magazine writer John Murph. "As a jazz soloist, you had your Trummy Youngs and your Dicky Wells, but in the vernacular of bebop, he was the trombonist for that language. J.J. was a genius; he was no fly-by-night sensation. He was the man for all seasons, and I was drawn to that." After battling cancer and a muscular-skeletal disorder, Johnson took his own life on February 4, 2001. He left behind a legacy of groundbreaking work, with his own groups and recordings with Kai Winding, as well as on the recordings of Miles Davis, Dizzy Gillespie, Charlie Parker, Illinois Jacquet, Sonny Rollins, Ellla Fitzgerald, and others. Born James Louis Johnson on January 22, 1924, in Indianapolis, Indiana, the future trombonist began his musical studies on the piano, taking lessons at a local church. During his early teens, concurrent with his discovery of jazz, Johnson switched his focus to the saxophone. In high school, however, Johnson was only able to obtain a baritone saxophone, and because he could not make the instrument resemble the caressing tones of his childhood idol, saxophonist Lester Young, the young musician switched to the trombone. Johnson graduated in 1941, but instead of continuing on to college, he opted to turn professional right out of high school. Leaving Indianapolis, the trombonist found work immediately in Midwestern bands led by Clarence Love and Snookum Russell, touring with them during 1941 and 1942. While traveling and performing with Russell's group, he met trumpeter Fats Navarro, whose improvisational style made a lasting impression on Johnson. In fact, Johnson claimed that trumpeters, as well as saxophonists such as Young, Gillespie, Parker, and Roy Eldridge, influenced him to a greater extent than did trombonists. Consequently, when he applied the bebop technique to the trombone, Johnson played in clear tones and short notes, and some listeners wrongly assumed that he was playing the valve trombone, which lends itself more easily to articulation, instead of the slide trombone. "Making that adaptation to the trombone was very demanding," explained Los Angeles Times jazz writer Don Heckman. "It took a decade before other trombonists on the whole began to master what Johnson was doing." However, Johnson acknowledged to writer Ira Gitler in The Masters of Bebop: A Listener's Guide that his reinventing of the traditional trombone sound was not entirely original. Another trombone player, Fred Beckett, who played with Harlan Leonard and Lionel Hampton during the 1930s and 1940s, inspired Johnson to take the trombone--previously thought of as a melodic, light-sounding instrument during the era of swing bands--and apply it to the bebop style with rapid phrasing, complex harmonies, and offbeat rhythms. Beckett, said Johnson, as quoted by Ben Ratliff in the New York Times, "was the first trombonist I ever heard play in a manner other than the usual sliding, slurring, lip-trilling or gutbucket style." Although still a teenager, Johnson, with his unique style, was already gaining a reputation as one of the finest trombonists around among bandleaders, composers, and critics. As the late jazz critic Leonard Feather once wrote, as quoted by Los Angeles Times contributor Jon Thurber, "J.J. Johnson was to the trombone what [Dizzy] Gillespie was to the trumpet--the definitive trendsetter who established beyond a doubt that bebop was not beyond the technical possibilities of the instrument." From 1942 until 1945, Johnson played with Benny Carter's big band, making his recording debut with the group playing a solo on Carter's "Love for Sale" in 1943. The following year, Johnson performed at the first Jazz at the Philharmonic concert at the Los Angeles Philharmonic Hall. Led by the now-legendary impresario Norman Grantz, the event--billed as the city's premiere full-scale jazz concert--proved a huge success, fostering nationwide tours and a popular series of albums. During 1945 and 1946, Johnson performed with Count Basie's Orchestra. Here, too, Johnson was awarded plenty of solo space. Also in 1946, Johnson recorded his first session as a bandleader for the Savoy label. Thereafter, Johnson balanced his solo career with work as a much-sought-after sideman. Throughout the remainder of the decade, he performed with leading bebop musicians, including Charlie Parker, with whom he recorded in 1947 to become the only person to guest with the original Charlie Parker Quintet. Other affiliations included playing and/or recording with Dizzy Gillespie's big band, Illinois Jacquet, from 1947 until 1949, and Miles Davis, with whom he played on the trumpeter's landmark Birth of the Cool recording of 1949. On his own records as a bandleader, Johnson likewise enlisted top players, among them Bud Powell and a young Sonny Rollins. In the early 1950s, Johnson played with Oscar Pettiford and again with Davis in 1952. But despite staying active, he found that music was not enough to support his family. Thus, from 1952 until 1954, Johnson, who had always held a curiosity about electronic equipment, worked as a blueprint inspector for the Sperry Gyroscope Company. Fortunately, Johnson's fortunes brightened when, in August of 1954, he formed a two-trombone quintet with Kai Winding. Known as Jay and Kai, the format proved a commercial success, and in turn allowed Johnson to quit his day job. The group enjoyed a great amount of popularity through 1956. Afterward, Johnson and Winding disbanded in order to pursue other interests, though they would reunite occasionally over the years. Johnson next formed another quintet, which often featured Bobby Jasper. His primary focus, however, began to lean increasingly toward creating his own music. Beginning in the mid 1950s, Johnson undertook the writing of ambitious compositions, including his first large-scale work, "Poem for Brass." The four-part piece was featured on the 1956 Columbia Records album Music for Brass, conducted by noted composer, educator, and jazz historian Gunther Schuller. In 1959, the Monterey Jazz Festival commissioned Johnson to compose two pieces: "El Camino Real" and "Sketch for Trombone and Orchestra." Subsequently, the emerging composer penned his most challenging work for Gillespie, who was so impressed upon hearing "Poem for Brass" that he commissioned Johnson to compose an entire album's worth of material. The result, "Perceptions," recorded in 1961, was a 35-minute long suite that featured six trumpets, four French horns, and two harps. During the 1950s, Johnson also toured and recorded frequently with his quintet. Then, in the fall of 1960, he decided to break up the band. His reason for ending the group, he remarked years later, was that "it suddenly occurred to me that I needed a change," as quoted by the Washington Post's Adam Bernstein, "and I even began to wonder, was it possible that a musician or artist could be much too dedicated--so much so that he lived in a very narrow world." Although he continued to perform, Johnson's appearances grew more selective. During a period in 1961 and 1962, Johnson returned to work with Davis and continued to perform on occasion with saxophonists Rollins, Jimmy Heath, and Sonny Stitt. From time to time, he formed other small groups of his own, but devoted himself almost entirely to composing. In 1967, through the support of film composer Elmer Bernstein, Johnson secured a position as staff composer and conductor for M.B.A. Music in New York, a company providing music for television commercials. In 1970, he moved to Los Angeles to embark on a career in film and television. Throughout the decade, he scored music for television series such as Starsky and Hutch, Mayberry, R.F.D., and That Girl. In the 1970s and 1980s, he also wrote and orchestrated music for films like Barefoot in the Park, Scarface, Trouble Man, Sea of Love, and the "blacksploitation" movies Cleopatra Jones and Shaft. Despite his success in Hollywood, Johnson remained focused on jazz and his trombone. He practiced every day to keep his skills sharp--as evident on Quintergy and Standards, albums recorded live at the Village Vanguard in 1988. Even while not recording much at all, he kept winning Down Beat polls year after year. In the 1990s, under contract with the Verve label, Johnson recorded some of his most ambitious work, including 1994's Tangence, a collaboration with film composer Robert Farnon; 1996's Brass Orchestra, featuring work in the bebop style and selections from "Perceptions"; and 1998's Heroes, his final album, a straight-ahead jazz set. Heroes, wrote a Down Beat reviewer, as quoted by Bernstein, "leaves a general impression of solid craftsmanship, if not breathtaking artistic significance. The main news is that J.J. Johnson can always assemble a sturdy ensemble, and he's still a hero to trombonists everywhere." In 1987, Johnson returned to his hometown of Indianapolis with his first wife, Vivian. Following her death in 1991, he recorded an album in her name in 1992. In 1997, Johnson decided to retire from performing in public because of ill health. He had survived a battle with prostate cancer and spent the years prior to his death in 2001 in his home studio learning new technology available for composing and recording. Johnson's profound influence was made apparent by the wealth of family, friends, and members of the jazz community who attended his funeral. Nine trombonists filled the alter, among them Slide Hampton, Steve Turre, and Robin Eubanks, to perform Johnson's standard piece "Lament." Also making an appearance to pay tribute to Johnson was the legendary Max Roach. "He was a genius, always a great instrumentalist," Roach said at the funeral, as quoted by Down Beat's Matthew Socey. "Even at a young age, he was a rare person to have.... [H]e left us so much." - Mad Bebop , Savoy, 1946. -Modern Jazz Trombone Series, Vol. 1 , Prestige, 1949. -Trombone By Three , Prestige, 1949. -Modern Jazz Trombone Series, Vol. 2 , Prestige, 1949. -The Eminent Jay Jay Johnson, Vol. 1 , Blue Note, 1953. -Jay Jay Johnson All Star , Blue Note, 1953. -The Eminent Jay Jay Johnson, Vol. 2 , Blue Note, 1954. -Nuf Said , Bethlehem, 1955. -Kai + J.J. , Columbia, 1956. -Jay and Kai Octet , Columbia, 1956. -Blue Trombone , Columbia, 1957. -At the Opera House , Verve, 1957. -The Great Kai & J.J. , Impulse!, 1960. -Proof Positive , GRP/Impulse!, 1964. -Concepts in Blue , Pablo, 1980. -We'll Be Together Again , Pablo, 1983. -Things Are Getting Better All the Time , Pablo, 1983. -Vivian , Concord Jazz, 1992. -Brass Orchestra , Verve, 1996.